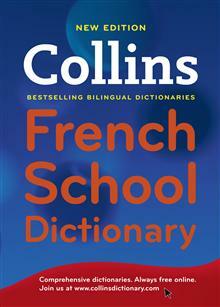 This new, fully revised edition of the Collins French School Dictionary is ideal for secondary school students looking for a dictionary that is clear, easy to use and in a handy format. / Collins French School Dictionary is specially designed for school students, and is ideal in the classroom, at home and during exams. / It contains all the words and phrases students will need, with key curriculum words highlighted, all essential phrases covered, and thousands of examples to show how French is really used. / The clear colour layout and alphabet tabs down the side of each page lead the students to the information they need quickly and without fuss. All main translations are underlined to help users go straight to the answer they are looking for. / The dictionary includes language tips and culture notes throughout the text. / Je suis, tu es!French verbs made easy! Each verb on the French side of the dictionary is cross-referred to a comprehensive 94-page verb guide, with full conjugations and example phrases showing the verb used in context. Also available in Spanish and German. 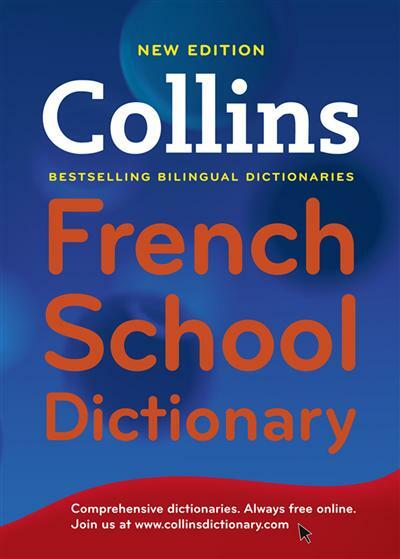 Other titles in the Collins French Dictionary range include Collins Gem French School Dictionary, Collins Easy Learning French Dictionary and Collins Pocket French Dictionary.